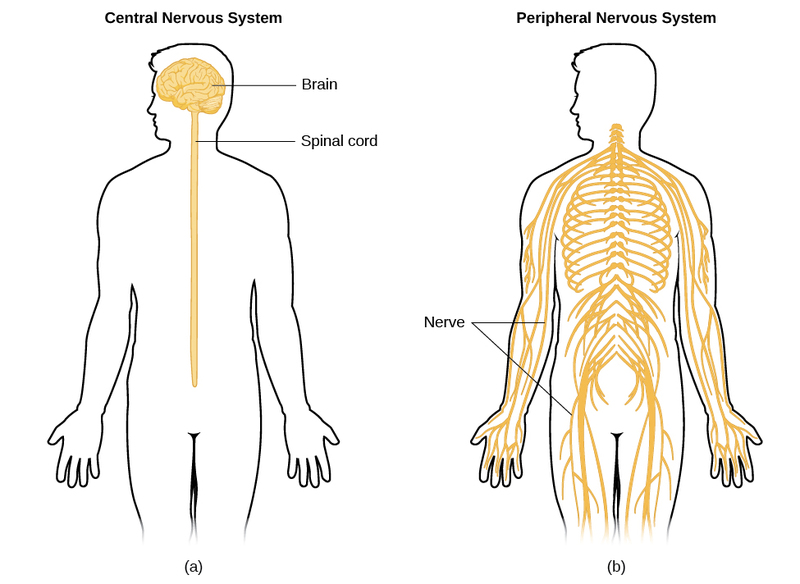 The nervous system can be divided into two major subdivisions: the central nervous system (CNS) and the peripheral nervous system (PNS), shown in Figure 7. The CNS is comprised of the brain and spinal cord; the PNS connects the CNS to the rest of the body. In this section, we focus on the peripheral nervous system; later, we look at the brain and spinal cord. Figure 7. The nervous system is divided into two major parts: (a) the Central Nervous System and (b) the Peripheral Nervous System. The autonomic nervous system controls our internal organs and glands and is generally considered to be outside the realm of voluntary control. It can be further subdivided into the sympathetic and parasympathetic divisions (see Figure 8). The sympathetic nervous system is involved in preparing the body for stress-related activities; the parasympathetic nervous system is associated with returning the body to routine, day-to-day operations. The two systems have complementary functions, operating in tandem to maintain the body’s homeostasis. Homeostasis is a state of equilibrium, in which biological conditions (such as body temperature) are maintained at optimal levels. Figure 8. 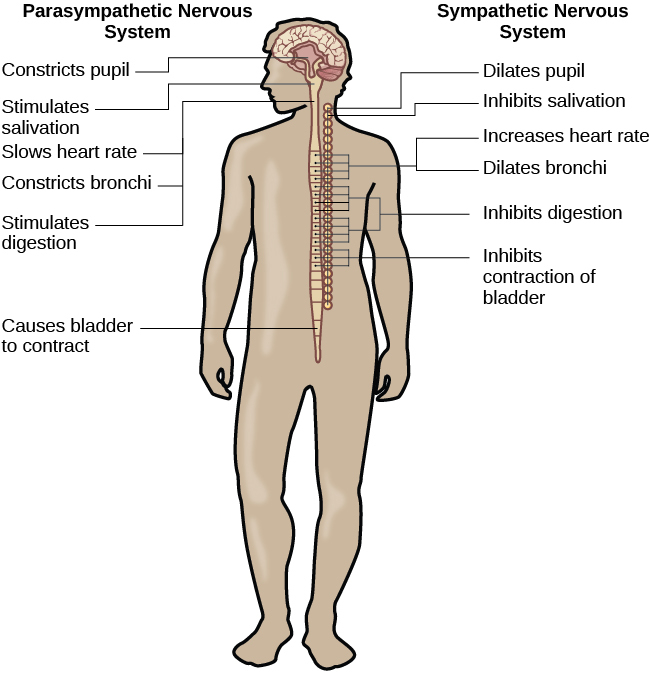 The sympathetic and parasympathetic divisions of the autonomic nervous system have the opposite effects on various systems. Parts of the Nervous System by Rajiv Jhangiani, Ph.D. is licensed under a Creative Commons Attribution 4.0 International License, except where otherwise noted.